Covalt, Hoover and Palmer. The list goes on and on. Names of people closely associated with Friday and Saturday's Southern Fulton and McConnellsburg doubleheader are also names closely associated with another game dear to the hearts of Fulton County. Exactly 30 years ago, Southern Fulton's 1985-86 boys basketball team hoisted the District 5 championship trophy for the first time in school history. 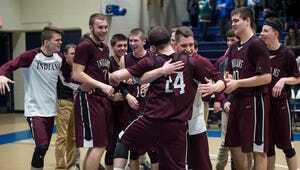 The Indians had just beaten Forbes Road in the only all-Fulton County district championship up to that date. On Friday, Kent Hendershot - who nearly cost SF the first time around - coached the Indians to their eighth district championship, the seventh under his regime. They defeated McConnellsburg, 40-35, in the first all-Fulton County district championship since. The very next day, Southern Fulton claimed the title against McConnellsburg in the first-ever girls all-Fulton County district championship. "This is awesome," Hendershot said. "Not many people give little Fulton County much respect, but for our league and our county to have the champion and the runner-up in both games, that's awesome. That speaks a lot for us and our little schools and what we're trying to do." Not only were the schools and Hendershot involved in both games, there are a slew of other connections to the first time around. Donnie Gordon was the game-high scorer with 21 points in the 1986 game, and he watched his son, Dylan, pile on 29 points for the Indians on Friday. "I was very proud of him tonight," Donnie said. "You could see it - he felt it tonight. We spent a fair amount of time talking about tonight, and he was nervous. McConnellsburg played one heck of a game, and I told him if you underestimate them at all, they will tear you apart." Donnie's daughter, Drew, also played for SF in the girls championship on Saturday, contributing four points, two rebounds and a steal. The first time around, Gordon was helped along by Hendershot's 18 points and nine assists. But it was Hendershot who missed a layup that was cleaned up by Wally Yanosik to send the game to overtime. "I remember that was a tough game," said Howard Mellott, who is the father of McConnellsburg junior Bronwyne Mellott and played for Forbes Road in 1986. "It was a close game at the end, and Wally Yanosik was the one who hit the big shot for them. It was pretty exciting, and it was just as hyped up with as many good players." Despite the Spartans taking a loss in the girls championship, Bronwyne contributed a game-high 22 points. Another local father, Tracy Covalt, and his brother, Chris, played for SF in the '86 game. Tracy's daughter, Jessie, played for the Indians this season. Moreover, Chris Hann, the father of McConnellsburg volleyball player Kacey, competed for Forbes Road. Connections on the court weren't the only local ties, either. Both coaches had a big part in the weekend's festivities. In 1986, Dave Hoover was the coach of the Cardinals. This year, he was assistant for the Spartan girls team. McConnellsburg dedicated its playoff run to Hoover, who passed away the day before the Spartans began their postseason journey. Additionally, 1986 Southern Fulton coach Larry Palmer is the current District 5 treasurer and the game manager for the championships. "You definitely get some friends along the way," said Mellott, who still enjoys the Fulton County rivalries. "I think for me, it's just the will to win and the thrill of the battle. You make friends with other players, and pretty much everyone is still on the court. It's a big battle on the court, but off the court, we all get along." It may have been 30 years since the last all-Fulton County district championship, but with the current talent in the area, fans may not have to wait another three decades. 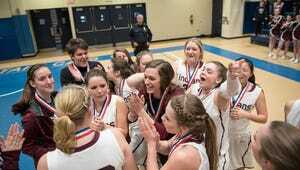 "When I came back here (to coach), that was the only district championship we had ever won, and I wanted to reestablish that momentum we had in the mid 1980s," Hendershot said. "I take a lot of pride in that. We've worked very hard, and the kids have bought into what I was selling. My goal 23 years ago was to get us to where we are competing for district championships."